The Wednesday rollout of Waymo One, Waymo's commercial self-driving taxi service, falls far short of expectations the company itself set earlier in the year. In late September, a Waymo spokeswoman told Ars by email that the Phoenix service would be fully driverless and open to members of the public—claims I reported in this article. We now know that Waymo One won't be fully driverless; there will be a driver in the driver's seat. And Waymo One is open to the public in only the narrowest, most technical sense: initially it will only be available to early riders—the same people who have been participating in Waymo's test program for months. This seems to be the latest sign that Waymo's technology is progressing more slowly than a lot of people expected—including Waymo's own leadership a year ago. People who have observed Waymo's vehicles on public roads in recent months report that the cars still struggle with unprotected left turns, merges, and other tricky situations. Waymo is widely seen as the industry leader. The company began working on self-driving technology in 2009, long before most other technology and car companies started taking it seriously. So if Waymo isn't ready to launch a fully driverless service after more than 18 months of intensive public testing, that should make us skeptical of claims from other companies that they'll be ready to launch fully self-driving technology any time soon. The launch of Waymo One feels less like the launch of a public, commercial service than a rebranding of its testing program. Waymo vowed to launch a commercial service before the end of the year, and Waymo One technically qualifies. But the service hardly seems more open to the public than the early rider program Waymo had last week. In a Thursday phone conversation, a Waymo spokeswoman declined to tell me how many customers had signed up for Waymo One on the first day or how many rides they'd taken. If a lot of people were signing up, you'd expect some of them to post photos or videos on social media, but 48 hours after the official launch I haven't been able to find any sign of people using Waymo One—and neither have other people. I'm sure Waymo is telling the truth when it says it has invited "hundreds" of early riders to switch to Waymo One, and I assume at least a handful of people have signed up. But this is not what normally happens when a big public company launches a major new product. Enlarge / This is a screenshot from Waymo's November 2017 video announcing the start of fully driverless testing. It shows fully driverless Waymo cars driving on residential streets that are almost empty. I wasn't the only reporter who was told that Waymo's first commercial service would be fully driverless. But in recent months, Waymo seems to have lost confidence in its fully driverless operations. The Information's Amir Efrati reported last week that "due to concerns about safety, the Alphabet company put so-called 'safety drivers' back behind the wheel of its most advanced prototypes." Indeed, it's not clear if fully driverless vehicles have ever accounted for a significant fraction of Waymo's testing activities. 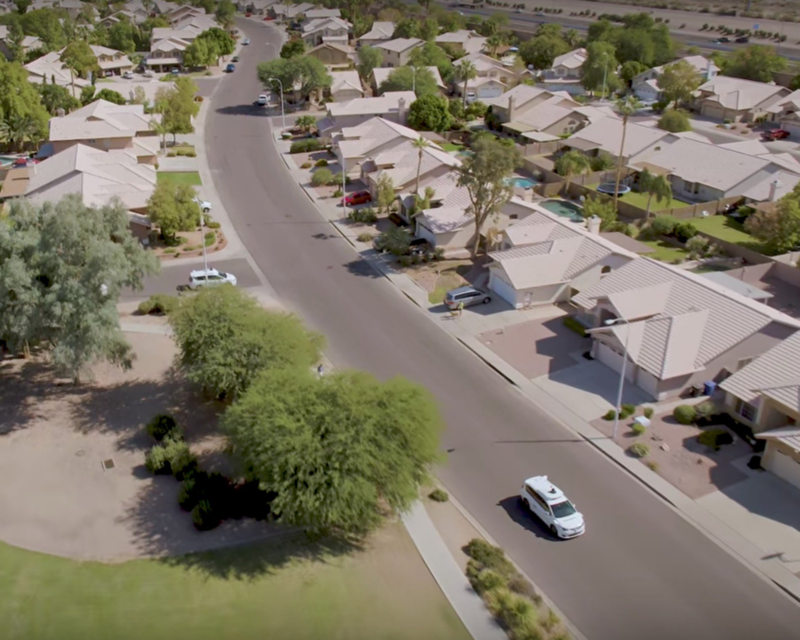 According to an August story by Efrati, fully driverless tests have typically been "in relatively small residential areas of Chandler, Arizona, where there is little traffic." That squares with the experience of Ryan Randazzo, a reporter at the Arizona Republic who has covered Waymo over the last two years. Because he's based in the Phoenix area, he's able to regularly observe Waymo vehicles in action and talk to others in the area about the cars—including three days in October and November when he followed around Waymo vehicles to see how they perform. "I don't know that anyone has ever seen one without a driver in the driver seat" since Waymo first announced driverless testing in November 2017, he told Ars. "They may have done it, but they don't tell us. I've asked five different ways—what percent of rides [are driverless]—they won't answer that question." Over the course of October and November, Randazzo spent three days observing Waymo's cars in action—either by following them on the roads or staking out the company's depot in Chandler. He posted his findings in a YouTube video. The findings suggest that Waymo's vehicles aren't yet ready for fully autonomous operation. "Lane changes appear to be a problem for the cars," Randazzo says in the video. When trying to move into a crowded lane, a Waymo car seemed to lack a human driver's ability to anticipate other drivers' actions and squeeze into an open spot. Instead, the vehicle would turn on its turn signal and wait for a few seconds for an opening to appear. If one didn't appear, it would turn the turn signal off and wait for a while before trying again. "It actually took this car almost a minute and a half to change lanes here," Randazzo said. "We talked to one person who uses these vehicles around the East Valley. He said that they sometimes miss their turns they're so hesitant." In another incident, a Waymo car was part of a line of cars approaching an intersection where a car crash was blocking the right lane. The human drivers saw the issue far ahead and began shifting to the left lane. The Waymo car continued straight and only began trying to merge left when it was a few car lengths away from the traffic cones. The car then abruptly cancelled the left merge and instead went right into a turn lane—Randazzo speculates that this was the human safety driver taking over the vehicle. That jives with a video posted to YouTube in September showing a Waymo vehicle struggling to merge onto a California freeway. According to The Information's Efrati, Waymo has struggled with turning from a low-speed residential street onto a major boulevard. This is also a problem The Washington Post observedduring a recent Waymo test ride. The Post reported that "left turns can be painfully slow" when turning onto a major traffic artery. With these kinds of challenges, it's not surprising that Waymo chose to keep safety drivers in its cars. And to be clear, I don't fault Waymo for doing this. Quite the contrary, they deserve credit for putting safety first. But if Waymo has largely halted testing with fully driverless vehicles—and there's a lot of circumstantial evidence that they have—it would be nice if Waymo would level with the public about this. And if even Waymo—long regarded as the industry leader—is struggling to roll out fully driverless cars, that may be a cause for skepticism that its rivals will achieve the feat any time soon. We're going to see more and more self-driving cars on our roads. But it might be a while before we see ones that are fully driverless. I wish I could Like this post about 50 times!! Still no evidence of any real rides ever havin' taken place. Just a few promotional videos showing the car driving around the block.